Freedom of Speech: to Be or Not to Be? D efinitely – to be! But only if we do want it by ourselves. We should not give the way to pressure and repression but jointly, confidently and persistently defend our rights to be indestructible in the difficult struggle for freedom. 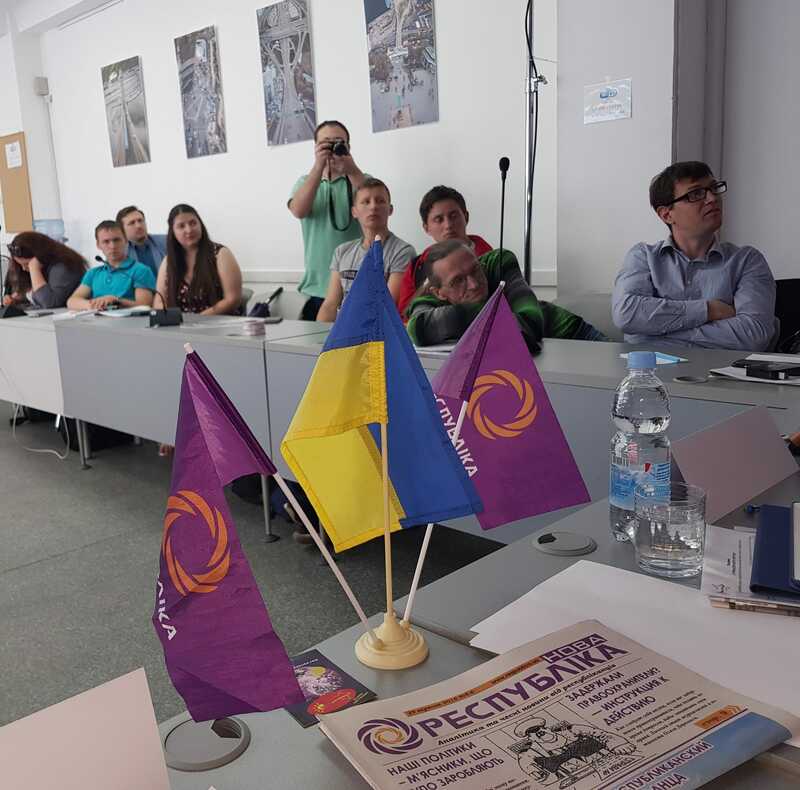 The Studrespublika and the newspaper The ‘New Republic’ organized meaningful dialogue in Kyiv in the format of Civic Lyceum II on ‘Freedom of speech in terms of security challenges: why cannot we limit it’. The participants were practicing themselves in the ability to listen and to be critical. A year passed since the Civic Lyceum I on this theme, but during this time the situation of freedom of speech has only worsened, such a disappointing routine of news flicks and reports from the authoritative international organizations. 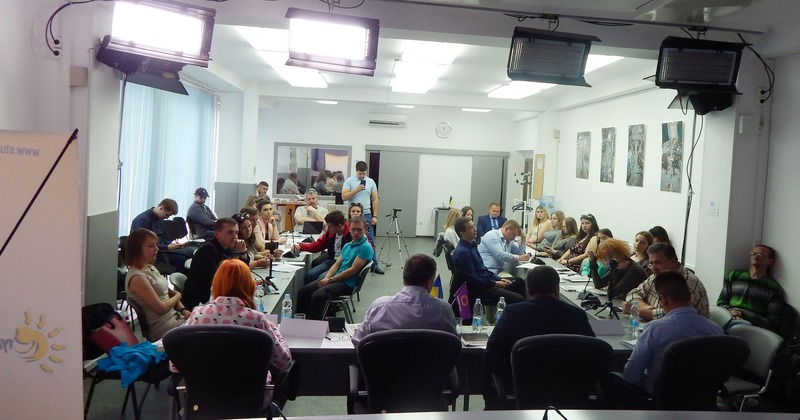 This fact made the topic of the Civic Lyceum II more relevant and leaded to the meeting of concerned citizens and powerful experts (Yevgenia Bilchenko, Serhiy Datsyuk, Igor Guzhva (via Skype), Volodymyr Ishchenko, Oleksiy Jacubin, Ruslan Kotsaba, Lina Kushch, Dmytro Vasylets, Andrey Yermolaiev and Denis Zharkih) on May 19, 2018 in the Ukrainian News Agency in Kyiv. 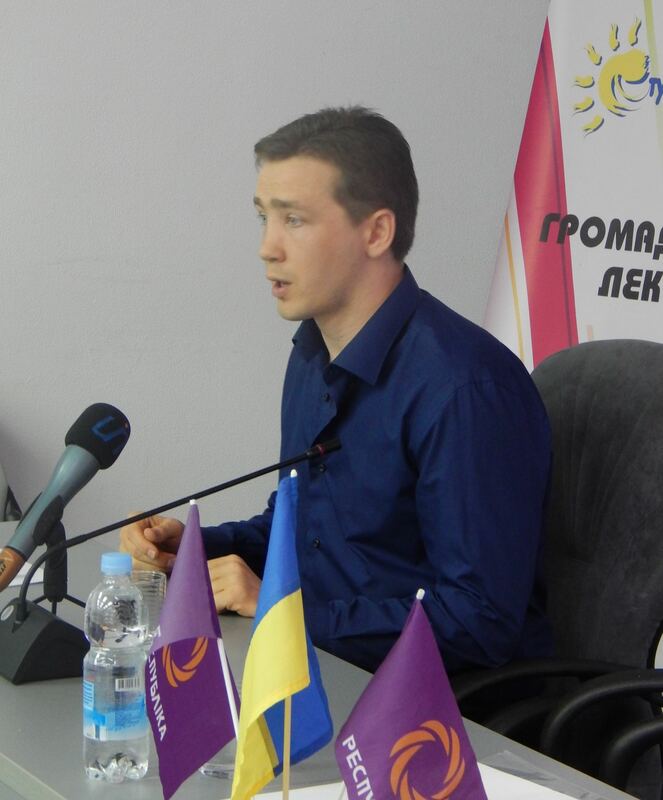 Also MP Andrii Derkach and representative of The Ministry of Information participated. Summary of the discussion is given below. 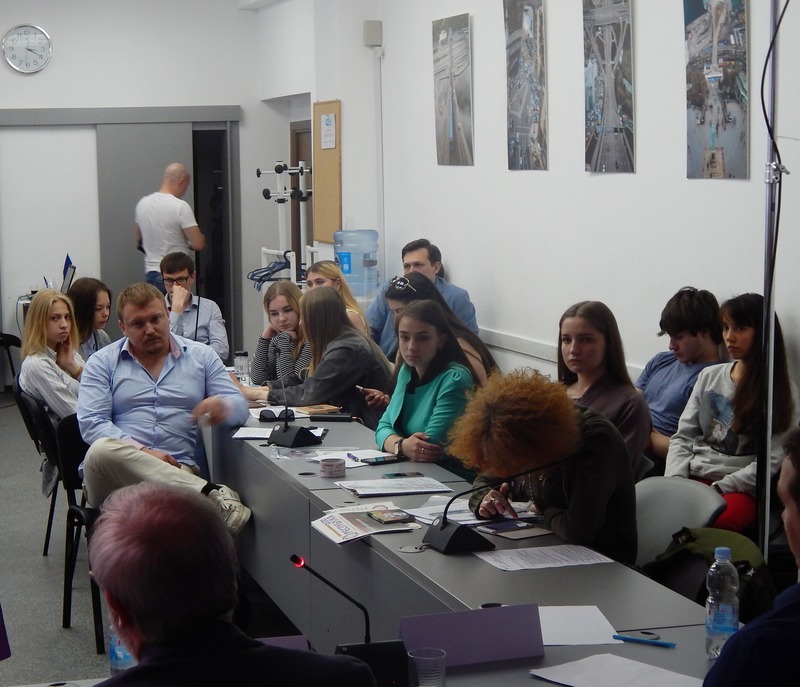 During the opening of the event, republican`s leader Pavlo Viknyanskyy said: ‘This topic is dangerous, it is preferred not to be noticed. Like there are no problems with human rights and freedoms as life seems to be normal, people walk along the streets, cafes are full… But we must not hesitate, because the rights are taken away unnoticed — it’s extremely difficult to fight to get them back’. Our country is rich, it is ours, and it is possible to do a lot of cool stuff in it, but it is impossible in case if there is no exchange of opinions and no free atmosphere. Even worse, if on all constitutional territory of Ukraine intimidating and detaining of journalists and ordinary citizens for subjective opinion will continue. 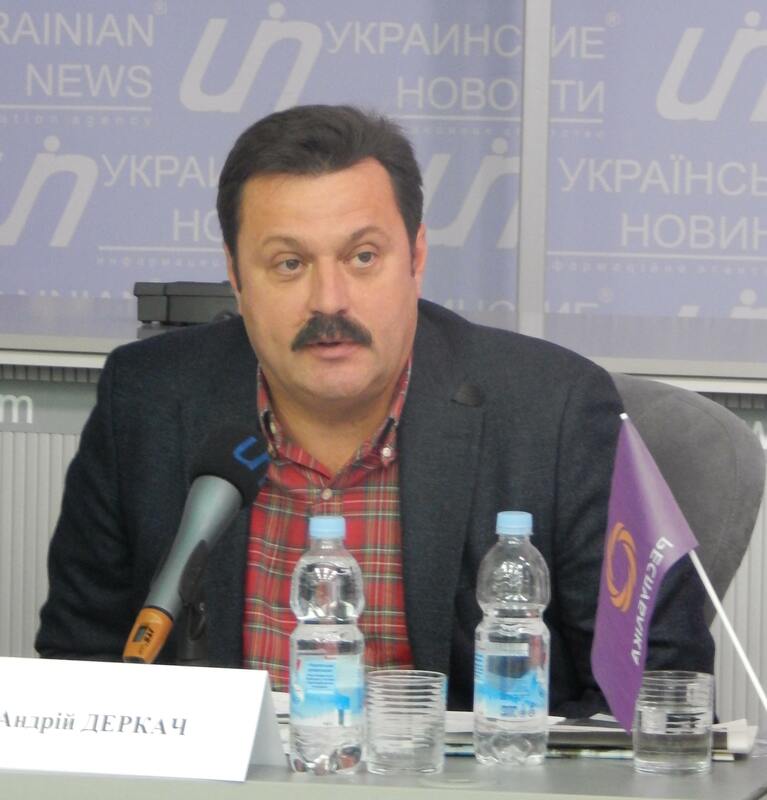 Andrii Derkach, The People’s Deputy of Ukraine, the chairman of The Interfactional Parliamentary Association `For the Protection of Violated Rights of Citizens and Against Political Repression `Forbidden to Forbid`, was the owner of top media, therefore, he is a specialist and practitioner. He highlighted several global challenges which media face with: social networks, transformation into multimedia and the lack of opportunities for normal monetization. As for Ukraine, the politician noted the situation that very liberal people in former times, including journalists, are now seizing the rights by themselves. There is an attempt of establishing a dictatorship by manipulating of liberal values. Political opponent can`t be put in prison, because it leads to the never-ending circle of revenge. The problem is that people of power are small-scale, and poorly educated. We must also understand the specifics of the audience of The Society of the Spectacle, linking to the terminology of Guy Debord. According to Andrii Derkach, about 300 thousand of people are those who think critically — and there is also ordinary grandpa from a village in Sumy region, who likes to watch the world as a TV-series: he perceives Klyuyev and Khoroshkovsky as relatives, and even talks to Yulia. If we want to be clear, we really must be simpler. 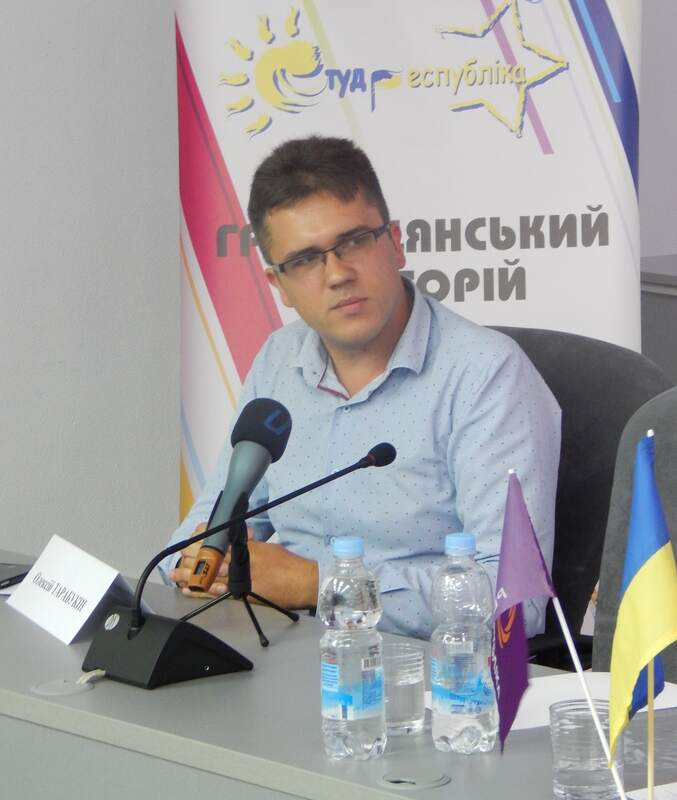 Oleksii Tarabukin, the Head of the Sector for Strategic Communications of The Ministry of Information Policy of Ukraine, shared his experience in recognizing manipulation and fighting against fakes and spoke about fact-checking. He expressed the opinion that no prohibition would ever work, but only qualitative consumption of information from ‘objectively truthful’ information resources. Also, with the introductory remarks, Vira Andriyuk, the main editor of The ‘New Republic’ informed about the 2nd anniversary of the newspaper of progressive people. 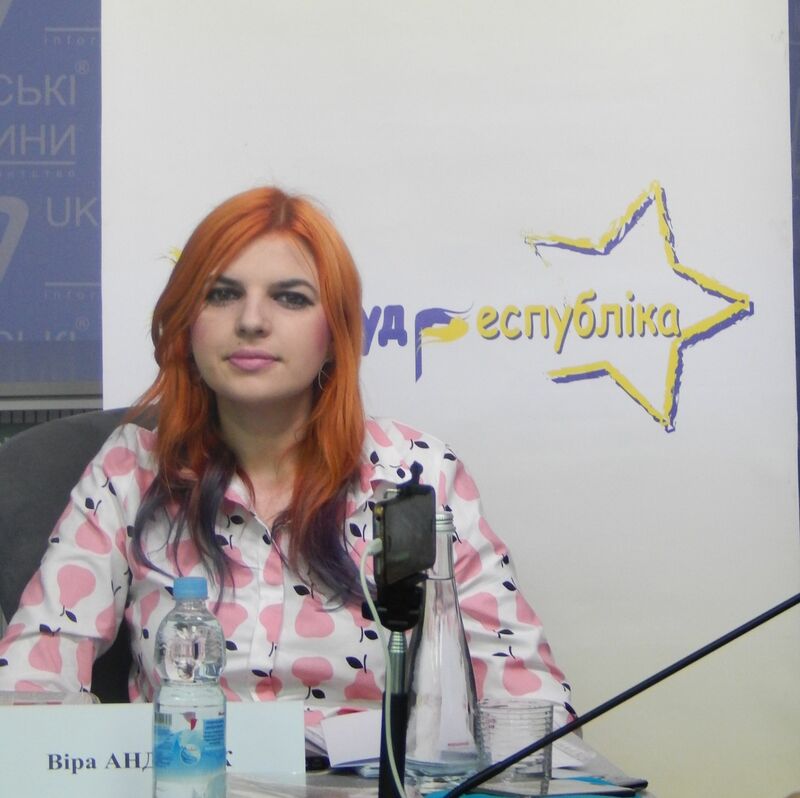 Vira expressed concern at the extremely low level of journalistic solidarity that is unacceptable under the current conditions of freedom of speech. 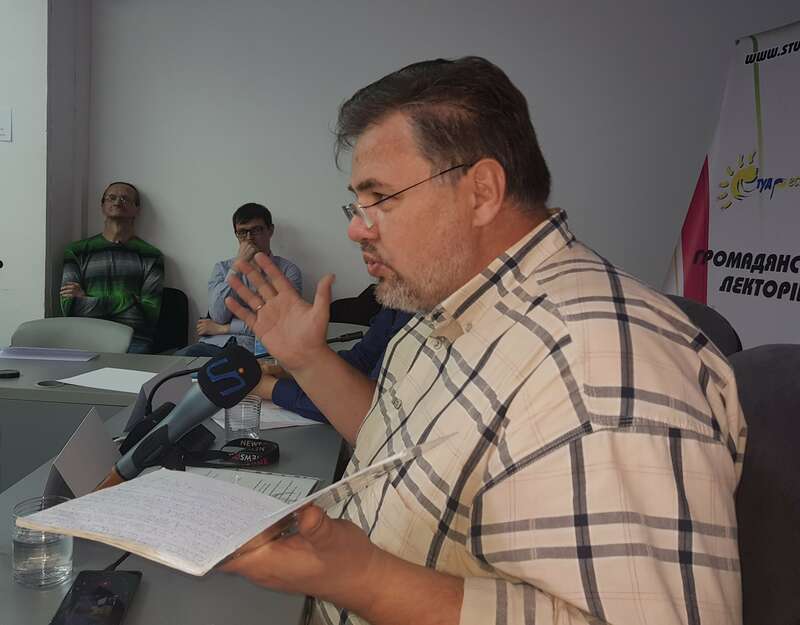 Also, Igor Guzhva, the editor-in-chief of the popular site Strana.ua, who is now forced to stay in Vienna due to the persecution of the authorities, appealed to the participants via Skype. One of the country’s most successful media managers said that even before the Euromaidan and the war the authorities tried to take information flows under control, influenced the owners of the largest TV channels, bought up media which were critical to the Family of Yanukovych, sought the fire of uncomfortable journalists (as happened to the main editor of the newspaper Segodnya Igor Guzhva for the first photos of the residence Mezhygirya). But there was not such a lawlessness as we see today, criminal cases were not fabricated, and journalists were not imprisoned. 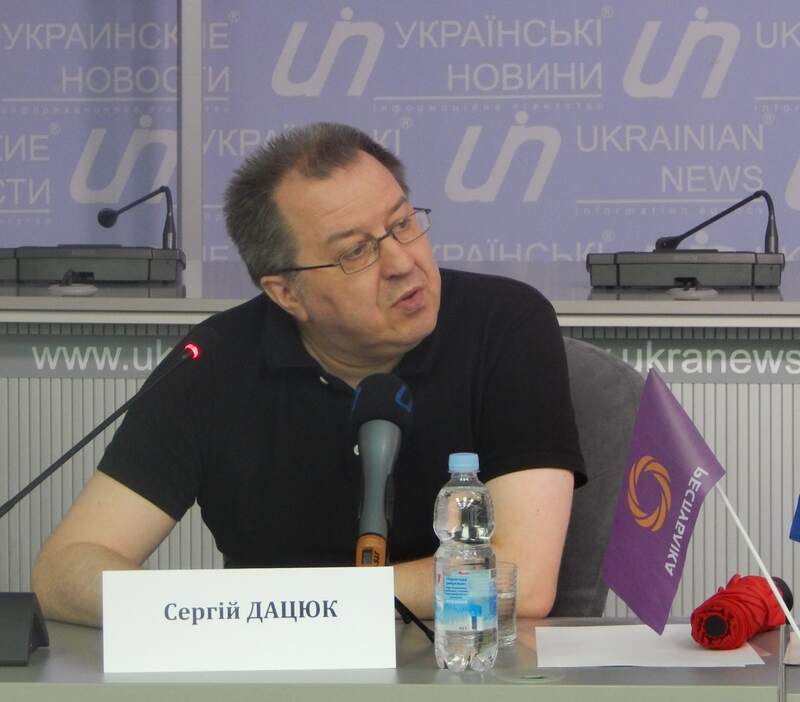 Because of the authorities didn`t have a moral justification for reprisals against journalists. Only the fact that the authorities are ineffective and bogged down in their own disassembly, are not respected and sabotaged at all levels. This is an opportunity for maneuver. But ‘they can come to you in any moment and cease in a very rigid way’. The hopes for normalization are related to the political processes in Ukraine: a high opposition result in the elections is needed to present different points of view. Gradually the West will become more active in defending journalists, moreover the fight against ultra-right organizations is becoming a more serious issue in Europe. ‘About journalist’s work under conditions of government repression’ have spoken two journalists who were imprisoned for their opinion and expressing their words. They are Ruslan Kotsaba, a prisoner of conscience due to the version of Amnesty International, and Dmytro Vasylets, a political prisoner who came back from prison less than 2 months ago. 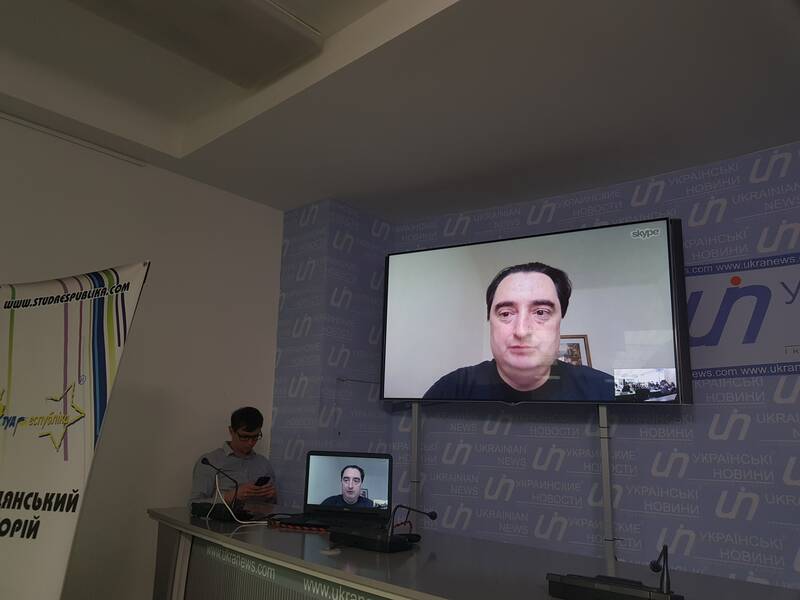 Ruslan noticed that being in the center of events, we must immediately film them on the phone and spread them through social networks or other public sources, because only this can bring real facts to citizens. In his opinion, while someone has not reached such a big number of followers on one’s YouTube channel as 10-12 thousand people, the one can live safely. But as soon as the interest in the resource increases, a person becomes a so-called LOM (the leader of public opinion) and must be ready to such situations as conducting a search, they can plant something, arrest and even sentence to imprisonment for a rather long term. The main advice in the situation of security officials hit-and-run: do not sign anything, immediately call for a lawyer and, if you’ve got arrested, write a lot of appealing letters to various public authorities or officials. 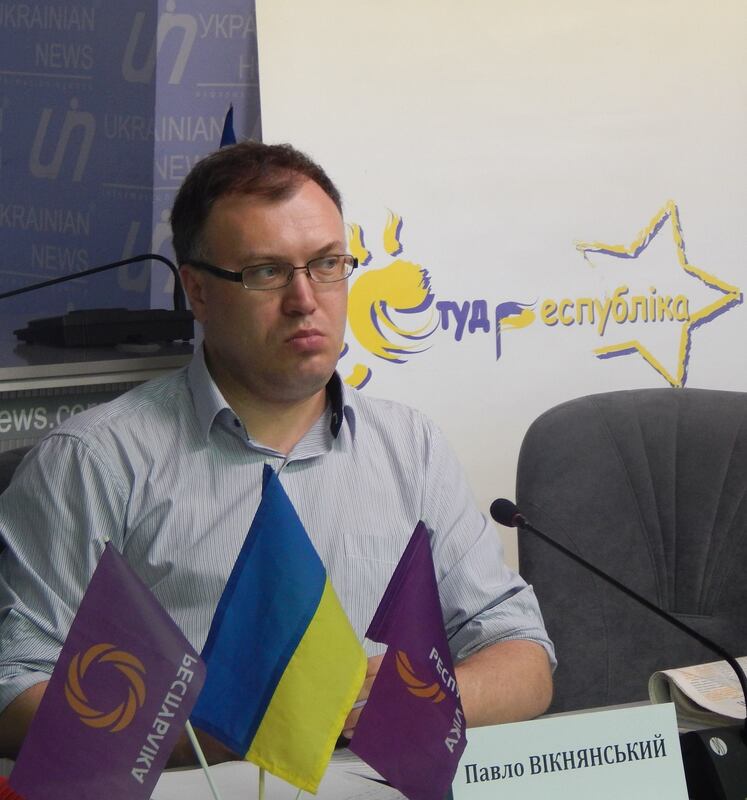 Dmytro Vasylets spoke about his sad experience, how he was attributed to ‘anti-Ukrainian activities’ and sentenced to nine years of imprisonment, while not giving explanations or access to the facts of the charges, basing on… the secret of the investigation. ‘The main argument of the repressive apparatus about imprisoned journalist is – they want to break you. The system is constructed in such a way that, if necessary, anyone can be locked up for a year or two…’, — the journalist said. 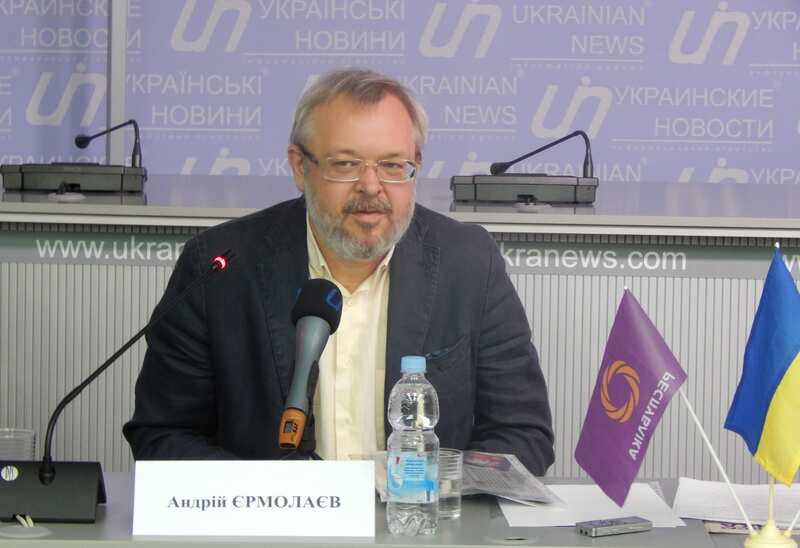 The philosopher, Director of the Institute for Strategic Studies `New Ukraine` Andrey Yermolaiev did a report named ‘Elections of the President or Elections of New Ukraine?’ The expert stressed that there is a phenomenon of informational mass consciousness, which is anonymized and characterized by the effects of equalization and the supposed competence of its elements. In social networks, we become more primitive, this is a way of collective degradation. Society does not have time to develop mechanisms for self-control in the modern information world, which means also an alternative agenda. It is important that the patience rating in Ukraine is phenomenally high. As for the elections, sociology shows that we have no opinion leaders. ‘Once Kuchma managed to technologically and politically create a situation where society voted for less evil, knowing that it was evil, but chose it as a less. In the current situation, all are evil’, — said the intellectual. Why is it so? The broadest majority of modern politicians don`t have a positive political background; they don`t have a positive hero, because the image of a possible positive future of the country is destroyed. This is a challenge and a chance for political forces to formulate a social utopia: a rational and emotional alternative positive image of Ukraine after the war. ‘If there is no freedom of identity, certain things will be imposed on you: corporations will impose you a pattern of consumption in the form of advertising, and identity — by propaganda’. Freedom of speech is permissible insofar as this state permits, but it doesn’t allow your freedom of speech to go beyond this identity and cast doubt on its right to monopoly rent (taxes). The modern state directs all of these through an ‘established by someone’ agenda, which formats freedom of speech, managing narratives. There are 3 types of agenda: 1) civic or public; 2) media in the form of news, expert comments, and relevant programs; 3) strategic, which is obliged to be formed by influential politicians. In developed societies, all of them must be present but shouldn’t coincide. What should we do when there are none of these agendas in a society, but only the one that is served through the media and formed by the oligarchs, the actual owners of the media? Then create own, alternative agenda, it should be without advertising, propaganda, protection and promotion of politicians or oligarchs, and at the same time, it must be strategic and involve civic activism. Yes, it’s hard, but we must do it. In terms of agenda, freedom of speech is the right to formulate an alternative, at least civic agenda; the right to present another agenda instead of the imposed one. 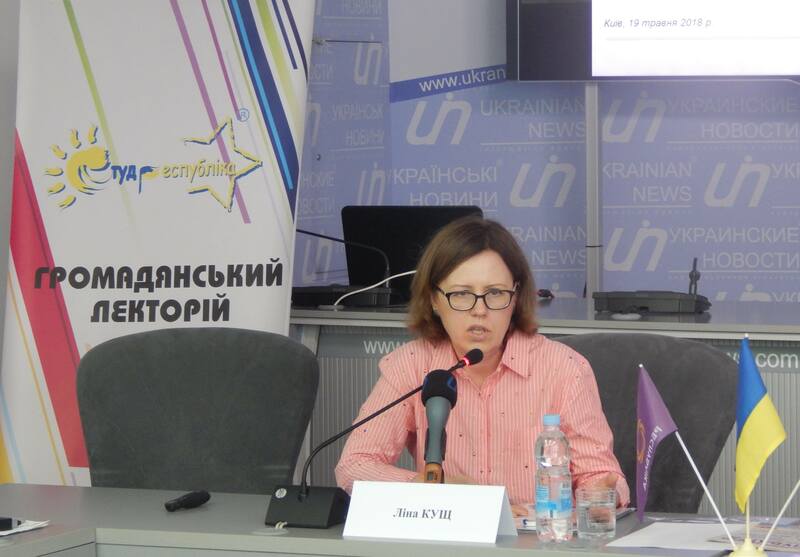 The next speaker was Lina Kushch, the First Secretary of the National Union of Journalists of Ukraine. She spoke about the violation of freedom of speech in the uncontrolled part of Donbas and the hate speech in the Ukrainian media. 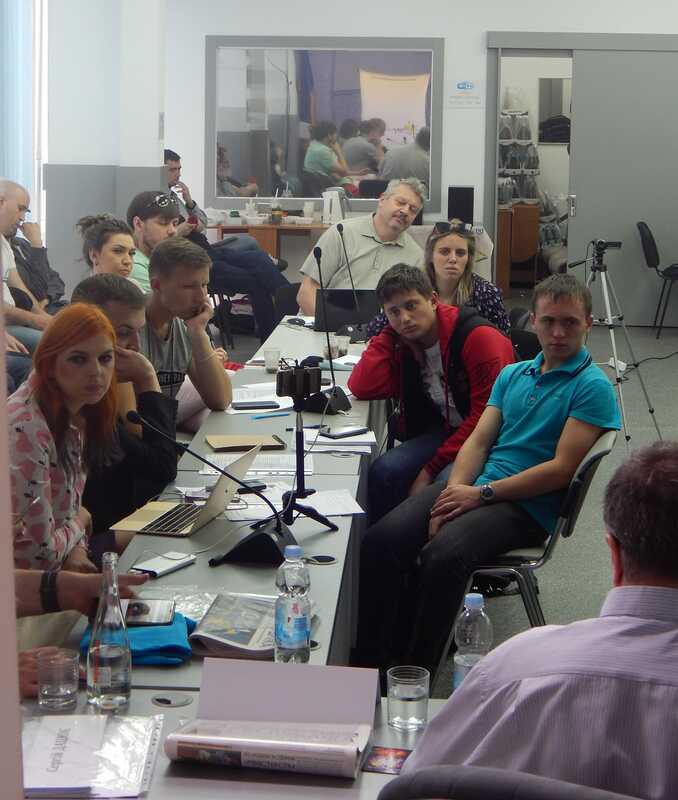 Some of the media from Donbas after the beginning of armed conflict moved to the ‘mainland’; on the uncontrolled part there are 6 television channels and dozens of newspapers, all of which became ‘state’ and are printed in one printing house and have similar content, which means that they are under full control. For now, more than 200 Ukrainian sites are prohibited in the uncontrolled part of Donbas, although not all local providers follow this rule. For 3 years there were unlawfully detained about 100-120 journalists (according to the SSU there were 28 of them, excluding those who were detained during daytime). 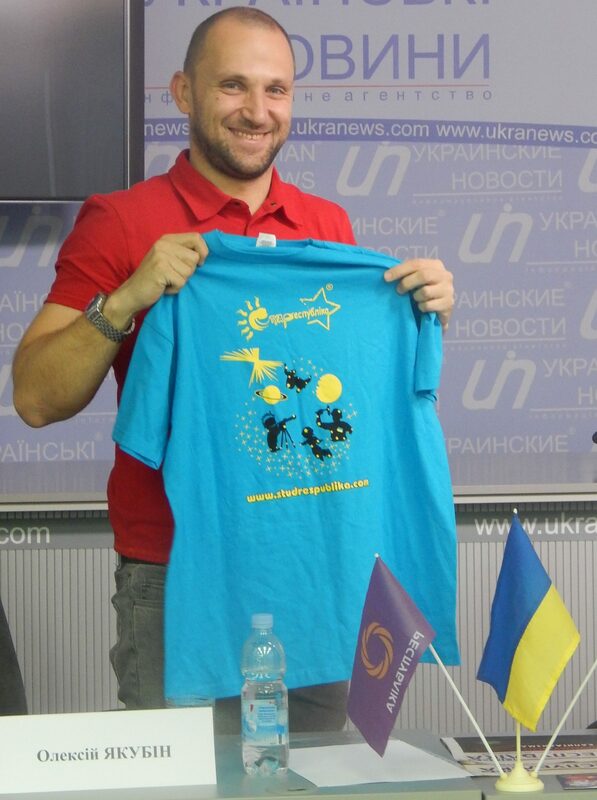 The speaker noted that the source of hate speech in Ukraine is political and state figures, social networks. It is applied to different groups of the population. Neologisms of hate speech that arose in 2014 towards the inhabitants of temporarily uncontrolled territories [and not only] are ‘vatniks’, ‘terrorists’, ‘separatists’, ‘brought a war into own house’, ‘called for Russian world’, etc. The consequence is even more isolation of groups against which hate speech is used, more aggression from them and even more conflict in society. 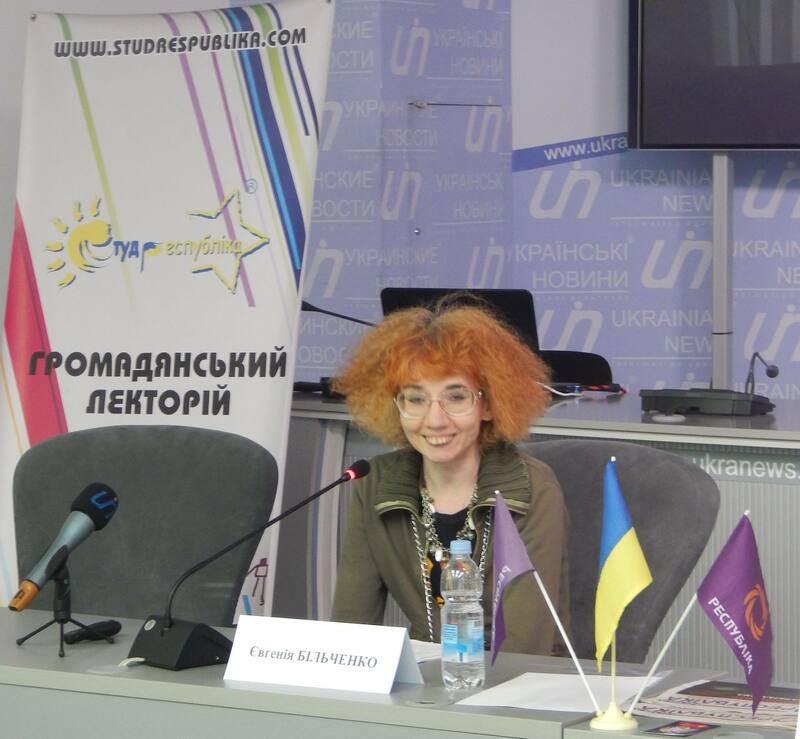 Yevgenia Bilchenko, a poet, professor of cultural studies during the report ‘Show censorship: the latest mechanisms of restricting freedom of speech in Ukraine’, noted that, in her opinion, there is no contradiction between radical nationalism and liberalism, since they mutually support each other. Society ceases to require censorship when disgusting, obscene, traumatic to us facts, which we are afraid of, disappear. Based on the psychoanalytic tradition, Yevgenia also identified 3 groups of people into which, as she thinks, our society divides: dogmatists, romantics and cynics. 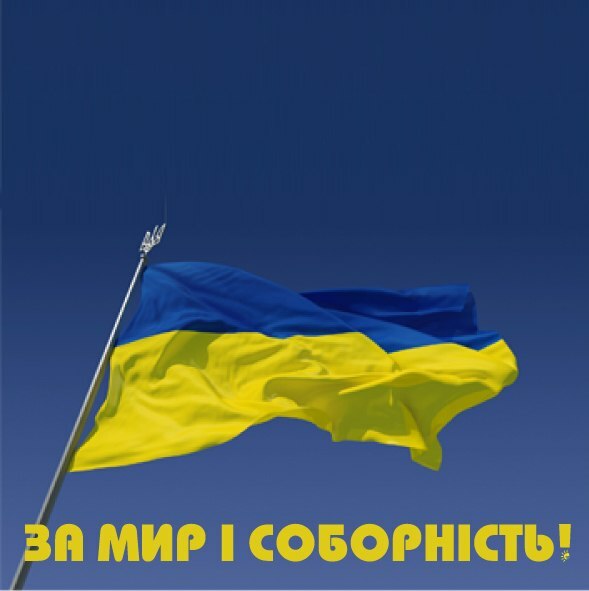 The speaker stressed that if Ukrainians are not censored, then they censor themselves even more to get a patriot badge. The broadest majority of censorship is a show that we perceive, that we enjoy, but the most important point is that we accept these rules of the game. But to us, on the contrary — we must liberate ourselves from within. Clear that the condition of freedom of speech is directly related to the regimen, the authorities. So, ‘Are there limits of power of ‘technocrats on the throne’: who is to blame? And what should we do?’ Political scientist Oleksiy Jacubin analyzed this topic in his report. We need to work with science, to restore the communication of citizens with it, not to allow politicians to manipulate us, using the authority of science. The government is manipulating us by telling that we need more technocracy. If there are any changes in society and politics are trying to implement them, referring only to scientific developments, then this way is wrong. It is necessary to ask an opinion directly to the group of citizens that will be subjected to these changes, so they should say the final word. In recent years, science has been actively corrupted to substantiate socially dangerous decisions for the community. Programs of ‘reforms’ from the 90’s now almost replicated… The postnormal scientific model, involving citizens, does not allow manipulating with science and introducing poor-quality changes or reforms for society. The question of the fate of millions should be transferred to the level of plebiscites. Civic enlightenment tools are also very much needed. 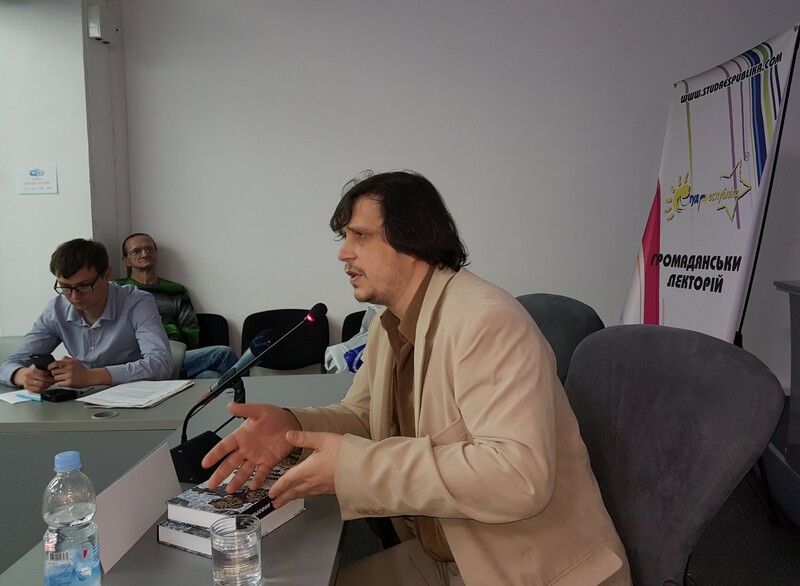 The final report on the topic: ‘Social mechanisms of freedom of speech: efficiency and chaos’ was read at the Civil Lyceum by a writer, psychologist Denis Zharkih. The speaker looked back to the original source of freedom of speech, which, in his opinion, was Ancient Greece, and compared how the freedom of speech developed there and in the ‘totalitarian’ Ancient Persia. 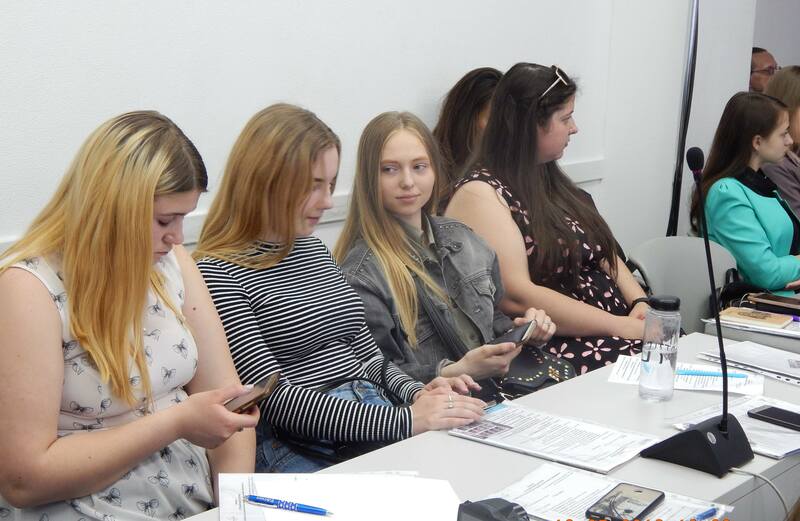 Although there already was communication, the communicators, Greeks, had less resources than in modern times progressive forces in Ukraine have. However, Greece, with the help of communication, outfought a much stronger troop of Persia. The communication culture’s main point is that we are together, we are equal. According to the speaker, everything works the same way now. Finally, Pavlo Viknyanskyy during the summing-up thanked experts and participants for the meaningful discussion and emphasized that the attack on liberties, on freedom of speech in particular, is a conscious policy of the oligarchic regimen, which manipulates the war and acts together with radical nationalists. To counteract, all progressively minded people of good will should not step back. We must face with people and endlessly think, doubt and develop. Solidarity is a rational thing that requires effort by the will, overcoming atomicity and fear. To develop an alternative agenda, we need to take practical steps: to collaborate, participate in each other’s events, protect, share, more trust and care of each other. Let us remember Karl Marx’s words that free development of each is the condition for the free development of all, and freedom of speech here is a key. 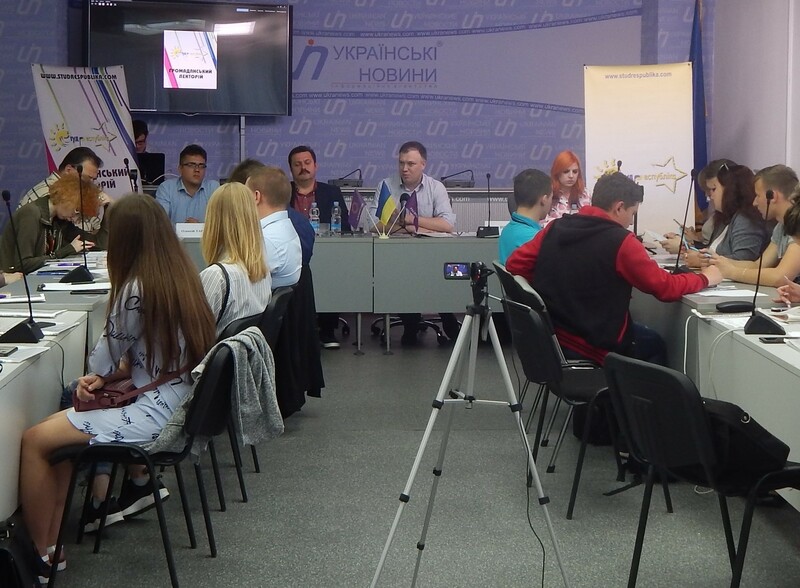 Later we will publish transcripts and videos of presentations, and Studrespublika will continue to work on further development of civil society and the conversion of Ukraine on the path of progress. Partners: The newspaper The ‘New Republic’, Commons Journal.